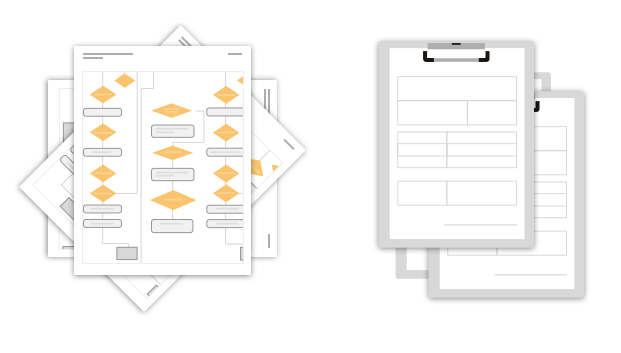 If you work for a government, chances are you work with many different types of standardized processes involving complicated flow charts, paper forms, or clunky legacy technology. In today's fast-paced web-based world, these can be extremely difficult to manage. 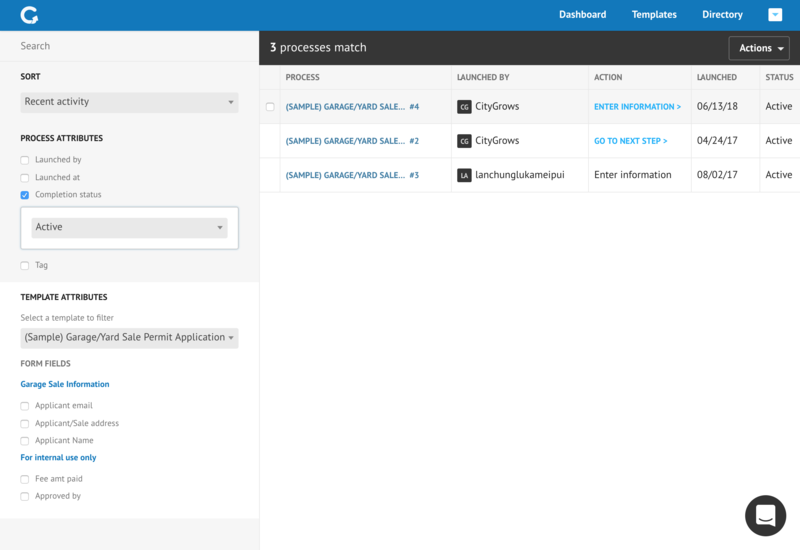 CityGrows is a simple, free platform that lets you create online versions of government processes, making them simpler, faster, and more effective without the need for technical knowledge, IT support, or expensive custom software. Because you or someone on your team does the setup themselves, you're always in control of how things work on CityGrows. And, because we're "self-service" technology, we can provide governments with access to excellent digital tools at low or no cost. Unless you wish to use our premium features, there's no cost to use CityGrows. That means you can get started right away and have a process ready to go in just a few minutes. 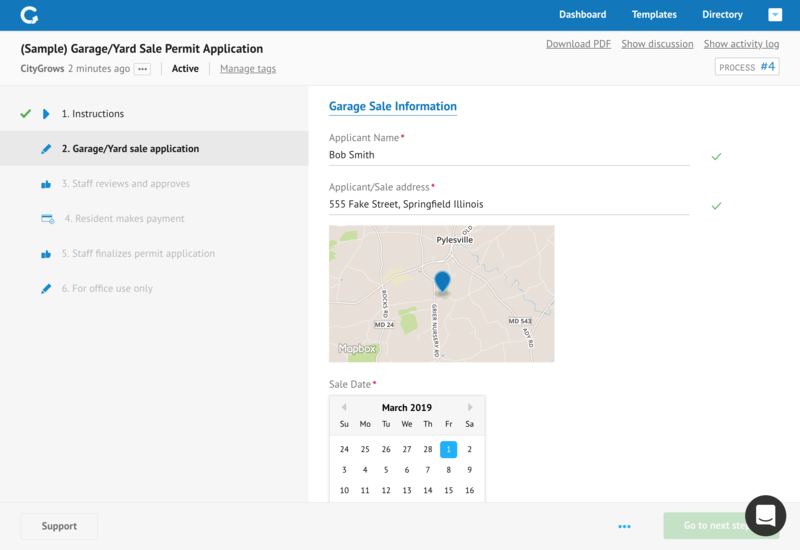 For the sake of simplicity, let's assume you'd like to offer your constituents the ability to get a garage sale permit online. 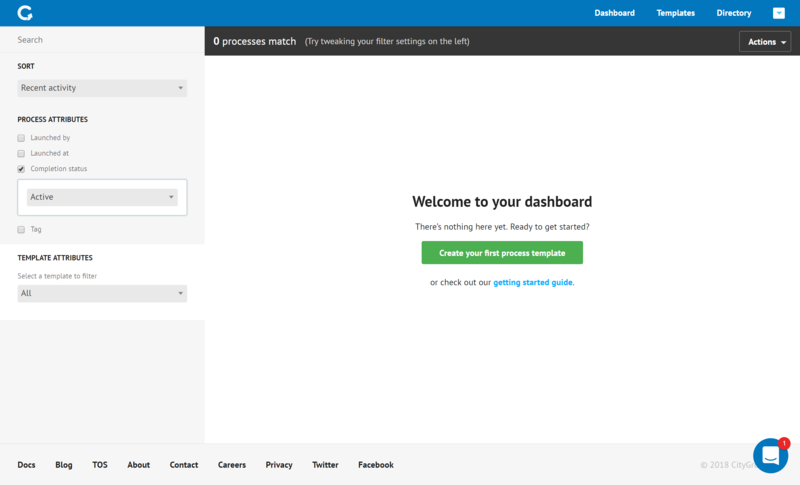 After creating a free account, the first thing you'll see is your dashboard, but since you just started there aren't any processes in it. The first thing to do is create a new template for your process. Once you have created your first template, you'll need to add steps, one for each component of the process. 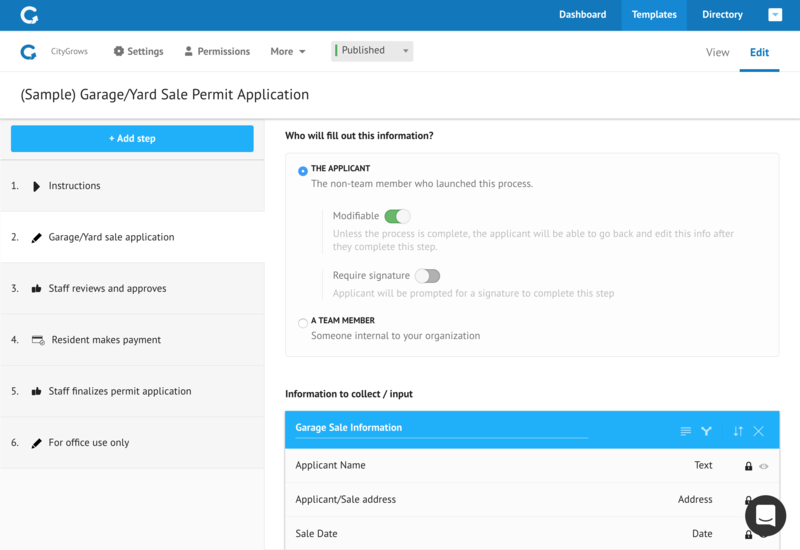 The template editor supports a wide variety of functions including sharing instructions and requirements (basic steps), forms (collect information steps), reviews, and payments. For each step, you'll decide whether it's done by an applicant or by someone inside of your organization and be able to specify things likeautomatic status notifications and timeframes. 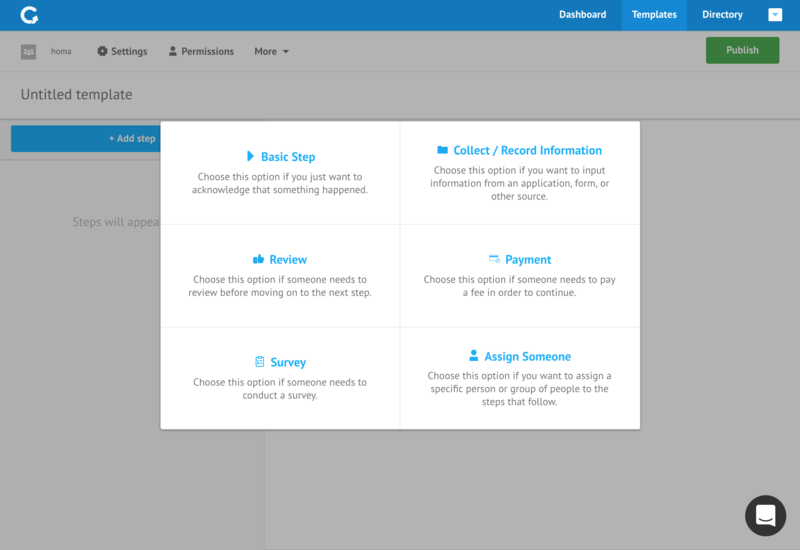 CityGrows makes it easy to add or remove questions, and add or change the order of steps. You can also add Logic to your forms, so that questions appear based on the answers to previous questions. 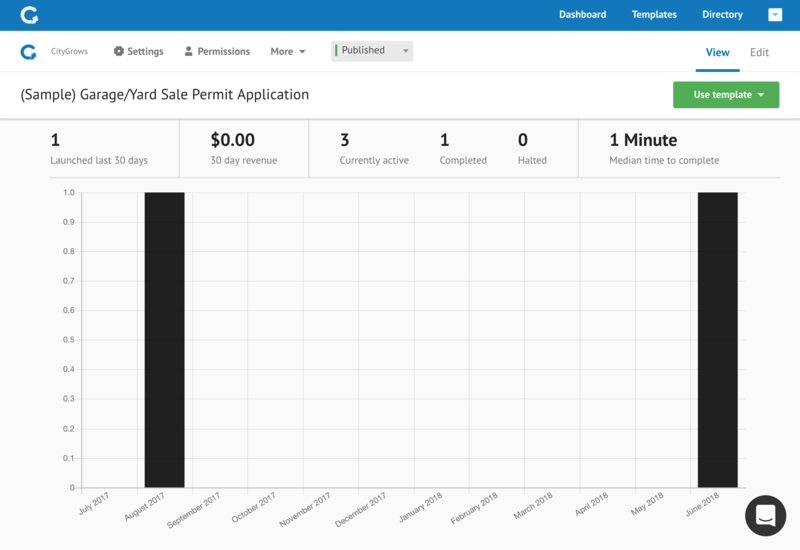 And CityGrows isn't just for online forms, it also works to track what you do behind the scenes for every application - things like getting review and approvals andcollecting community feedback/ survey responses all happen on the platform (and are easy to do on mobile or desktop). Once you've got a template set up, you can start to customize the look and feel of it through changing the banner image and adding a description. You can also add users to the template and to your Team. Teams are where you add your City's logo and configure your payouts. Once you've shared the template with your colleagues and tested it out, you're ready to publish and set it live by publishing the process. Once you've published your process, CityGrows will give you a link to share with your constituents. If you already have a place on your website with links to PDF permit applications, simply add your new CityGrows link to that page. You can also share your CityGrows links via email, social media, or through media coverage or newsletters. We find that once constituents have the option for online access, up to 85% of them switch to a digital process within the first year. When constituents click the link, they'll be guided through the permitting process from start to finish. And you'll be able to see everything your constituents are doing from your admin dashboard. You can also revisit the template to get more insights about how it's being used, how much revenue you're generating, and more. Every public CityGrows process automatically creates basic open data - no need to send things to a separate open data portal. You control which fields and information are included in the public open data when you set up your template. And for people who still really feel more comfortable with paper, there's always an option to download a PDF record of their application.